You are currently browsing the tag archive for the ‘Capri’ tag. Oh, I was once so independent, so footlose and fancy-free! I wanted to go on a trip–say, Paris; say, the Galapagos–and if I had no travel companion, that wasn’t going to stop me. On the contrary, the thought of striking it out on my own energized me. I was younger then. I was either single or in a relationship, but not a very serious one. I am less young now and in a committed relationship, and the man I’m committed to happens to be an excellent travel companion. Not everyone is lucky to travel well with their partner, but I’m one of those more fortunate. In the ten years we have been together, we’ve traveled hand-in-hand to spots around the U.S., but also to France, Italy, Australia and the Philippines. Our shared memories of these adventures add another indelible dimension to our bond. So when I was accepted into the Sirenland Writers Conference, which would take place in Positano, Italy, we had a bit of a dilemma. Ken took a stand. As envious as he might be, he was convinced that he would be a distraction and he wanted more than anything for me to focus on writing and meeting new writer friends and getting everything out of the conference I could. I understood his position and believed he was probably right. I’ve been to writers conferences before–albeit not in such a glorious setting–and they are intense experiences. I would miss him while there, but I’d be too busy to realize it most of the time. My hesitation, though, came with the pre- and post-trips. Given the cost of airfare and the fact that (uncharacteristically) I had the time, I decided I may as well tack on a couple of sidetrips: three days in Capri beforehand, three days in Rome afterward. It was in Capri where I realized that the thrill of traveling solo, for me, has shriveled up and died. It was off-season in Capri, wonderfully quiet, and most of my time involved walking for miles along desolate paths and roads hugging a coastline that at every turn offered up a startling vista of sea and sky and rock and foliage more magnificent than the last. In the face of such majesty, there is nothing to do but turn to the person at your side and whimper in stunned appreciation. No one stood at my side this time, though. And it wasn’t just anyone I missed now. The bittersweet moment evoked an actual, physical pang in my chest. That this beauty should not be shared–the disappointment shook me with the force of tragedy. So what I did was, I took pictures. Dozens and dozens of them. I would capture this, damnit, and I would email the photos to Ken and it would be like he had been there, sharing these moments with me. A camera is not an eye, though. Nor is it a heart. That night, I sent two postcards home to Ken, two different views of gorgeous Capri. I sent him a postcard every day of my trip–after Capri, there was Positano and then Rome. In all these places, a dozen times a day, I set my eyes on a breathtaking landscape or ate an amazing meal or felt moved by the pealing of ancient church bells. I didn’t have to write that I missed him. He knew that already, as I knew he missed me. I’d been proud once of what I considered my free spirit, my willingness to tackle whatever came my way all on my own. I can still do that, but apparently I no longer want to. Grotta Azzurra: Only 11 euros! On my recent trip to Anacapri, the western and quieter side of the Isle of Capri, I set out one morning for the infamous Grotta Azzurra. 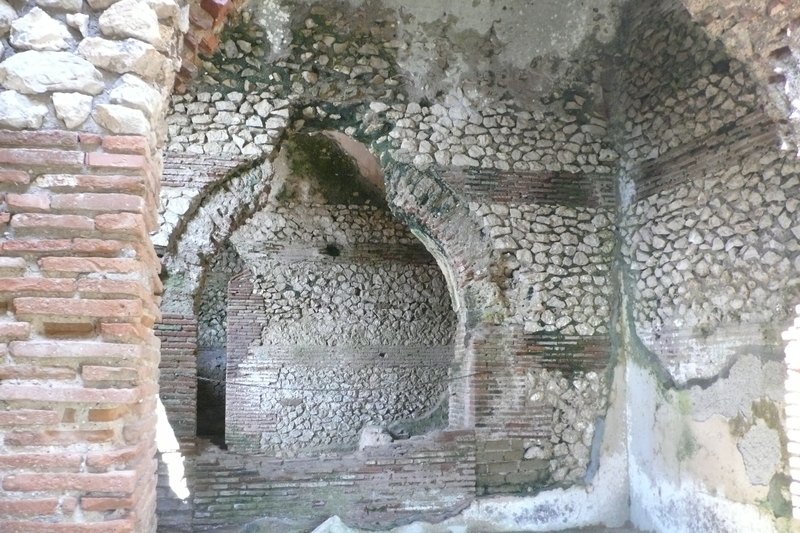 I admit I knew little about the grotto, but since I’d heard of it, it must surely be worth seeing. The advantage of staying in Anacapri was that I could walk there rather than take a bus, taxi or boat from Marina Grande in Capri. It was a long walk and it was off-season, which meant that I barely encountered another soul. In fact, I came across more dogs than people. There seem to be a lot of dogs on the island and many roam freely. The vistas along my walk were beyond stunning and I took my time, snapping photograph and after photograph, though knowing a camera could never see what my eyes could. Almost an hour later, I reached the grotto and climbed down the steps to where I could get a rowboat to take me inside. Most people were arriving on the boat from Marina Grande and they transferred directly from that boat to the smaller rowboats. I was the only one who waited at the Anacapri stairs and it took a long time for me to coax a boatman over to me–perhaps because I was alone (i.e., less profitable). Finally a man took mercy on me and helped me into the rocking boat. The boatman introduced himself as Marco. He then informed me the visit would cost 11 euros and if I liked his service… He left the sentence unfinished, knowing I had received the message loud and clear. Laying down his oars, reminding me again–down, flat–Marco tugged on chains attached to the sides of the cave and pulled us over the swell at the mouth of grotto and inside. I was allowed to sit up now and when I did, for the first time in my life, I saw BLUE. I didn’t know till then that I had never seen blue before. That idea had been forming in my mind all along the coast-hugging road on my way to the grotto, but now I was utterly convinced. The blue was otherworldly, a light coming from below and casting everything in an ethereal glow. Water slapped against the sides of the boat while Marco began to sing something softly, unintelligibly–all of which might have been moving were it not negated by the giggling of Japanese tourists in three other boats in the cave, which magnified every sound. And yet it was gorgeous. Marco paddled us around in circles a few times and I took the obligatory pictures which, again, I knew would never begin to capture it. The tour lasted five minutes, no more. For just 11 euros. My guide did not enlighten me on what made the water inside the cave so blue, what made it glow so. Though I knew he spoke English, he barely said a word to me, and I gave him a couple of euros extra anyway. I wanted to go over to the other side of the island, so he managed to get me on the boat with the big Japanese tour group going back to Marina Grande. Another 11 euros. Back at the hotel, the proprietess told me what made the water so blue (daylight enters through an opening below the grotto and is reflected up – http://www.capri.com/en/grotta-azzurra), and I wondered to myself why Marco didn’t tell me at least that much–to add to his “service.” If I’m honest, I was a bit disgruntled. Over dinner that night, thinking about my day, I debated with myself if the five-minute visit was worth all the money. After all, I’d also hiked up to Villa Jovis, the spectacular ruins of the villa built by Emperor Augustus and last lived in by Tiberius. I spent an hour there and could have lingered longer were I not famished. The entry fee was a mere 2 euros. 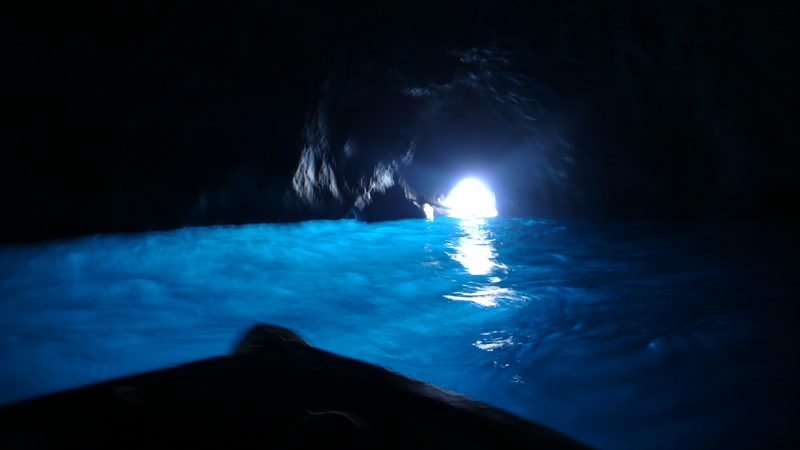 In the end, I decided the Grotta Azzurra was worthwhile in the way that the major attraction of any place usually is. I may never get to Capri again, they know that, and that fact alone seems to warrant the hefty admission price. There’s nothing new to be learned here–this is the case at virtually every famous attraction in the world. A less generous traveler would label the grotto a tourist trap, but I’m not inclined to be so harsh. Had I not visited its major attraction, I would have gone home feeling like I’d missed out–a worse feeling than being ripped off. 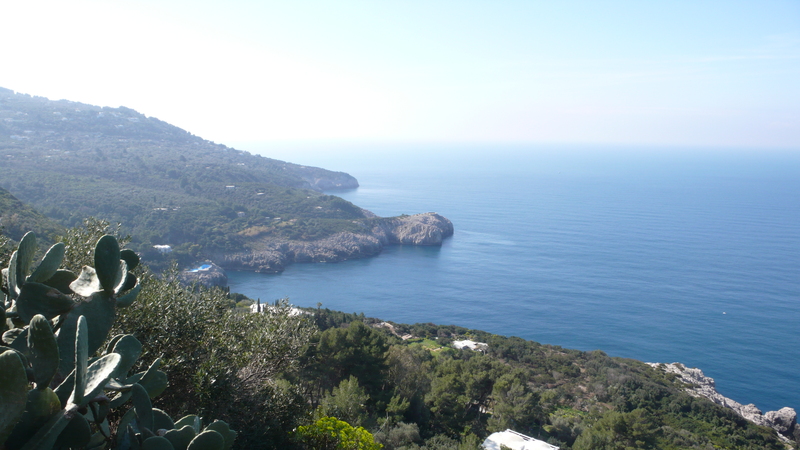 After all, Capri–like many places we visit–relies on tourism dollars and who am I to quibble? I’m not rich, but I had traveled all the way from New York to this fairly remote place and complaining would have seemed terribly petty. Satisfied, I poured another glass of wine from the carafe I’d ordered, a carafe, incidentally, that cost only 8 euros.